Dozens of protesters set fire to a government office building Wednesday, forcing workers to crawl out windows as former U.N. chief Kofi Annan tried to resolve the deadly dispute over Kenya's presidential election. The melee started after police fired tear gas at stone-throwing youths during a memorial service organized by the opposition to honor those killed in Kenya's post-election violence. 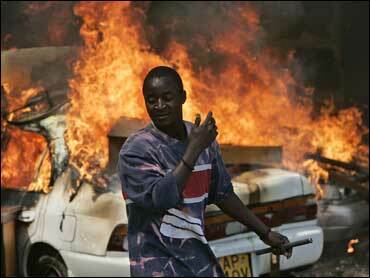 Some 685 people have been killed in riots and ethnic fighting since the Dec. 27 vote. "This is a war between the people of Kenya and a very small bloodthirsty clique clinging to power," opposition leader Raila Odinga told about 800 supporters gathered at a sports ground in the capital, Nairobi. Just outside the grounds, young men were stopping cars, beating people and taunting police. Police held fire but eventually responded with tear gas, some of which landed inside the sports ground and forced the mourners to flee. About 50 of the young men then set upon the government-owned telecommunications building, smashing windows and starting fires. "We don't know what happened," Mary Bwire, a secretary at the office, told The Associated Press. "Suddenly there were stones everywhere. We all hid under tables." She and several other employees crawled out ground-floor windows to safety. Later Wednesday, Kenya's opposition called off plans for a day of protests set for Thursday under pressure from Annan, a small victory on the former U.N. chief's first day of mediation. Police have banned all rallies, and at least 24 people died in three days of protests last week. Most deaths were blamed on police. "On the request of the mediation team we have called off the activities we had planned for tomorrow," William Ruto, a leading opposition figure, told a news conference in the capital, Nairobi. The election returned President Mwai Kibaki to power for another five-year term, but the opposition and international observers say the vote tally was rigged. Also Wednesday, about 15 miles outside Nairobi in Limuru, police fired shots at men with machetes who had been blocking the road and demanding to know the ethnicity of people trying to pass, witness Nancy Chumba said by telephone. Two people were fatally shot, according to a police source who asked that his name not be used because he is not authorized to speak to the media. Another two people were found dead in the capital's slums, police said. Annan is the latest international figure to try to intervene in the standoff. The chairman of the African Union, Ghanian President John Kufuor, failed even to persuade Kibaki and Odinga to agree to meet. The fighting has pitted protesters against police, but there also have been clashes between members of Kibaki's Kikuyu ethnic group and other tribes. During Wednesday's memorial service, Odinga said Kenya's 40-plus tribes should not be at war with one another. Beatrice Michael Achieng, 35, was at a mortuary Wednesday that was the starting point of the opposition's memorial procession. She was collecting the body of her 13-year-old daughter, who was shot outside their home in a Nairobi slum. "I think the protests should stop. I don't want to hear about Raila. I don't want to hear about Kibaki. My daughter is gone and we need peace," Achieng said. "I am feeling very bitter and angry at the police. I haven't eaten since the day my daughter died. She was my first born and I've even thought of hanging myself." Both sides in the dispute have traded accusations of who is behind the violence, with the government and the opposition each saying they will take the other to the International Criminal Court in The Hague, Netherlands.